Surgical resection remains the gold standard for the treatment of localized adenocarcinoma of the extrahepatic bile ducts. Yet, treatment of loco-regional recurrences is not well defined. We present an unusual case of distal adenocarcinoma of the extrahepatic bile ducts that was treated with surgery and relapsed two years later with a solitary recurrence on the tract of a previous Redon drain. In addition, a review of the literature on management of loco regional relapses is presented. The ideal management of these patients still remains undefined. Decisions are made based on clinical parameters from retrospective series, such as tumor grade, surgical margins or lymph node involvement. Prospective studies, that include molecular and genetic markers, are needed to improve patient selection and outcomes on this population. Biliary tract neoplasms are relatively infrequent malignancies. Adenocarcinoma of the extrahepatic bile duct comprises around half of all bile duct neoplasms. Surgical resection remains the gold standard for this disease although adjuvant chemotherapy or radiation should be considered in selected cases. Treatment protocols for loco-regional recurrences are not well defined and include surgery, chemotherapy, radiation, or best supportive care. 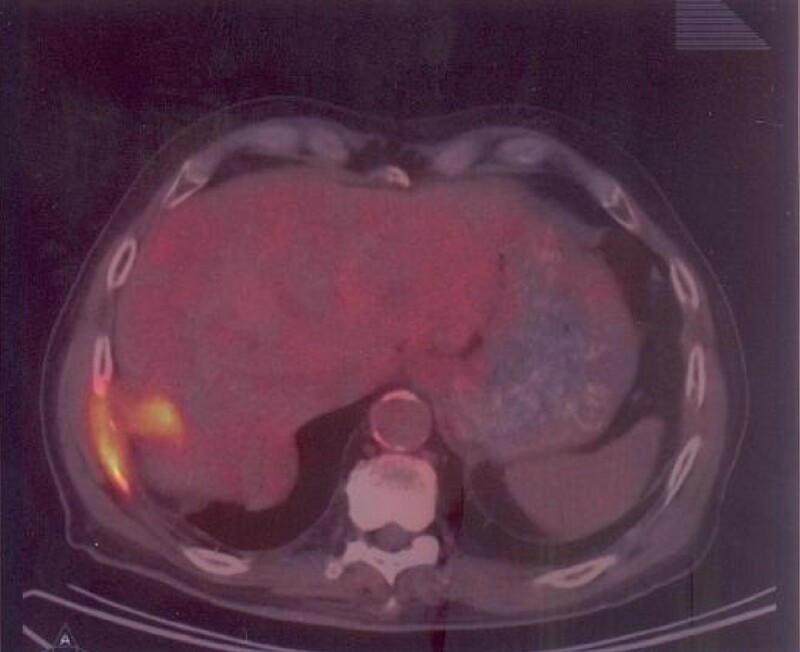 We present an unusual case of adenocarcinoma of the extrahepatic bile duct treated with surgery that relapsed two years later with a solitary recurrence on the tract of previous Redon drain. A 62 year-old Caucasian male presented with a seven-day history of painless jaundice with no other accompanying symptoms. His past medical history was remarkable for high blood pressure, hypercholesterolemia, coronary artery disease, tuberculosis, abdominal aortic aneurysm and benign essential tremor. At admission, physical examination revealed unremarkable findings aside from jaundice. Imaging tests showed a hilar-hepatobilliary mass consistent with the diagnosis of adenocarcinoma of the extrahepatic bile ducts (extrahepatic cholangiocarcinoma). On February 2003, the patient underwent a percutaneous biliary internal decompression followed by a laparotomy and curative resection of the tumour by cephalic duodenopancreatectomy. The resection was performed successfully and histological examination revealed an adenocarcinoma of the extrahepatic bile duct with no lymph node involvement and clear microscopic margins (pT2 pN0 as per AJCC classification). The patient did not receive any adjuvant therapy and his follow up consisted on CT scans, blood work, and physical exams every six months. Two years after the initial surgery, the patient complained of a four-month insidious and progressive abdominal pain localized in the right upper abdominal area along with a weight loss of around eight kilograms. Physical exam was unremarkable and abdominal imaging studies (including ultrasound and CT scan) reported only post-surgical changes with no evidence of recurrence. Blood work was notable for an elevated CA 19-9 at 880 Ku/L (normal range 0-39) with no other abnormalities. 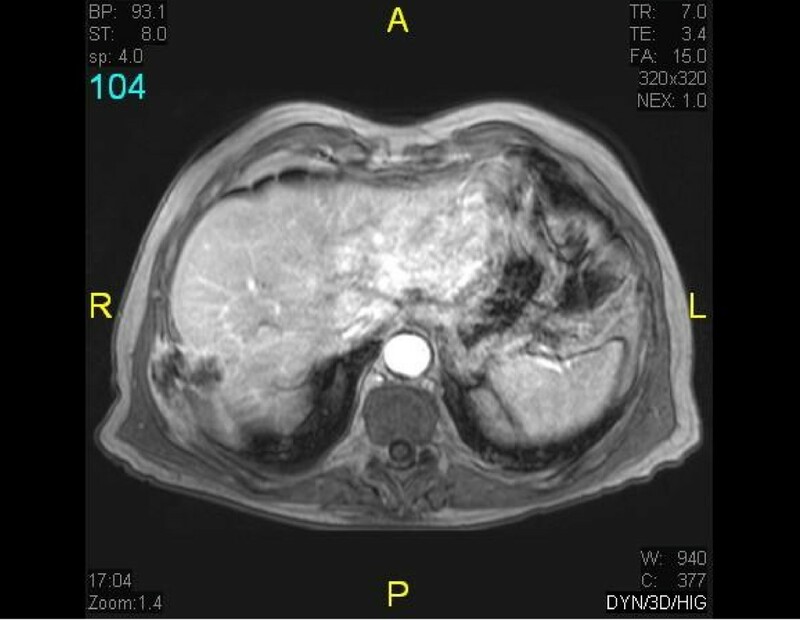 A liver MRI and PET-CT revealed a long string through the diaphragm, chest, and abdominal wall that extended from the surgical bed, with an intense glucose uptake at a standard uptake value of 7 (Figs 1 and 2). With the diagnosis of isolated recurrence in the chest wall of a previously resected cholangiocarcinoma, the patient underwent a new surgical intervention consisting of an en-bloc resection of segment VII of the liver, part of the diaphragm and the whole 11th right rib. Abdominal MRi. Isolated recurrence in chest wall of a previously resected cholangiocarcinoma: long string through the diaphragm, chest, and abdominal wall that extended from the surgical bed. PET-CT. Isolated recurrence in chest wall of a previously resected cholangiocarcinoma: intense glucose uptake. Pathology analysis revealed a tumour implant through the drainage course where the Redon tube was placed in the first liver procedure (Fig 3). No tumour was observed in the liver parenchyma and surgical margins were free of malignant cells. Surgical specimen. Tumour implant through the drainage course where the Redon tube was placed in the first liver procedure. After the successful resection of this unusual recurrence, the patient received six courses of adjuvant chemotherapy (gemcitabine and oxaliplatin) with good tolerance. On December 2007, twelve months after finishing adjuvant treatment, the patient presented again with abdominal pain, fever, and hypotension. A mass in the right upper quadrant was palpated on physical exam and imaging studies revealed the presence of a 10 cm lesion involving the chest wall, liver, and lung. Puncture of the mass confirmed the presence of adenocarcinoma as well as a purulent collection complicating this lesion. In spite of multi-antibiotic treatment and drainage of the collection, the patient died on January 10th 2008 due to refractory septic shock. Adenocarcinoma of the extrahepatic bile duct are relatively infrequent malignancies representing less than 5% of all solid tumors in adults and accounting for approximately 0.5% of all cancer deaths. Adenocarcinomas of the extrahepatic bile duct (previously referred as extrahepatic cholangiocarcinomas) are also distinguished as proximal or distal, depending on their location along the bile ducts. Surgery provides the only possibility for cure in these neoplasms. Distal cholangiocarcinomas have the highest resectability rates, while proximal tumors have the lowest (particularly perihiliar neoplasms) [4–6]. In one large series, the resectability rates for distal, intrahepatic and perihiliar lesions were 91, 60 and 56 percent respectively. Even in patients who undergo potentially curative resection, tumor free margins can be obtained in only 20 to 40 percent of proximal and 50 percent of distal tumors. These numbers are even lower if a proximal tumor free margin of at least 5 mm is considered to constitute a curative procedure. Thus, although surgical resection remains the gold standard for this disease, long term survival is rarely achieved because of frequent postoperative recurrences [10, 11]. The main clinical criteria for resectability are: absence of retropancreatic and paraceliac nodal metastases, no distance liver metastases or disseminated disease, absence of invasion of the portal vein or main hepatic artery (although in many cancer centers, including our institution, en bloc resection with vascular reconstruction can be considered), and absence of extrahepatic adjacent organ invasion . Patients with positive margins after resection or positive regional lymph nodes should be considered for adjuvant 5FU-based chemotherapy as well as radiation. Yet, no randomized trials have been conducted that support a standard regimen. Individuals with negative margins after surgery and negative regional lymph node involvement can either be observed or treated with adjuvant strategies . No clear guidelines exist for follow-up after surgery in this particular tumor type. Physical exam with routine laboratory tests every 3 to 4 months for the first 3 years post-surgery and then at longer intervals of 6 months until year 5 seems a reasonable approach. The role of CA 19-9 level in surveillance is not clear, but persistently rising levels often precede radiological evidence of recurrence by a number of months. Therefore this marker has been routinely incorporated in follow-up schemas. Which imaging tests to be performed is a topic that has not been specifically addressed in prospective trials, although CT scans of the abdomen every 6 months for 2 to 3 years after surgery is probably the most common approach in routine practice. However, as referred in the case presented, in several occasions CT and abdominal ultrasound are not sufficient to detect loco-regional relapses, which could be easily determined on MRI and PET. While recurrence is mostly loco-regional in the majority of proximal tumors, distal cholangiocarcinomas recur frequently at distant sites including the liver, peritoneum, and lung[14, 15]. Like pancreatic, gallbladder and hepatocelular cancers, adenocarcinomas of the bile duct have a predisposition to seed an can recur in needle biopsy tracts, abdominal wall incisions wounds and the peritoneal cavity, and therefore it is recommended to be especially careful in the physical exams in each follow-up visit. 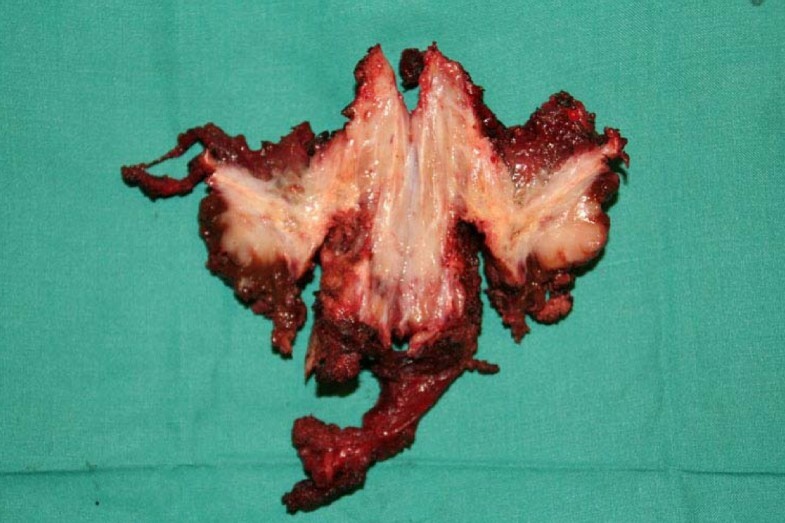 The case presented illustrates an example of an unusual pattern of relapse for adenocarcinoma of the extrahepatic bile duct on a draining sinus from a previous surgical procedure. Moreover it shows how the ideal management of these patients still remains undefined. No prospective data exist to set definitive recommendations about the optimum treatment after a curative resection of adenocarcinoma of the extrahepatic bile ducts. Currently, decisions are made based on different clinical parameters that have been established as prognostic factors in retrospective series, such as tumor grade, surgical margins, or lymph node involvement. Surgery is generally not indicated for recurrent bile duct adenocarcinoma due largely to the location of recurrence, technical difficulty, frequent distant metastases and aggressiveness. However, in patients with prolonged relapse-free interval and favorable location, should be an option to consider. More recently, several molecular markers have been explored as possible determinants of invasiveness and relapse. Expression of EGFR, HER2 and VEGF has been correlated with disease recurrence and could be incorporated into the decision-making process of deciding adjuvant treatment in this patient population . Another retrospective analysis investigated the correlation of c-met, cox2, and IL6 expression with invasiveness and lymph node metastasis in a series of 114 patients . Additionally, the importance of epigenetic alterations in the process of cholangiocarcinogenesis has been highlighted recently with respect to their potential as diagnostic and prognostic tools . The current management of patients with relapsed adenocarcinoma of the extrahepatic bile duct after resection of the primary tumor remains poorly defined and is based only on small retrospective series. Further prospective studies are required in order to design the most appropriate treatment strategy on this population. In addition to the clinical knowledge, it may be beneficial to incorporate molecular and genetic markers into the treatment decision algorithm of this neoplasm. JRP and ID conceived the idea for the manuscript, conducted a literature search, and drafted the manuscript. EDV and YQ performed surgery, obtained specimen images and critically revised the manuscript. FPR provided and reviewed pathological images FB obtained radiological images used in the manuscript. MH critically revised the manuscript. All authors read and approved the final manuscript.